Single Female Home Buyers Continue to be a force in the market. For the second year in a row, single female home buyers accounted for 18 percent of all buyers. This group was the second most common type of home buyers, behind married couples at 63 percent. Single male home buyers came in third at 9 percent. Share of first-time buyers continues to fall. The share of first-time buyers continued to fall for the third year in a row to 33 percent. This number has not been above 40 percent since the first-time home buyers credit ended in 2010. Low inventory, rising interest rates and student loan debt are all contributing factors in the continued decline of this number. Buyer continue to rely on Agents and the internet to find the right home. For the third year in a row, 95 percent of home buyers used the internet at some point in their home search, and 50 percent said they found the home they eventually purchased online. Overall, 87 percent used a real estate agent in the purchase of their new home. With low inventory, buyers are relying on their agent’s knowledge of markets and neighborhoods to find listings rather than depending only on online searches. Student loan debt continues to be an issue. Once again, student loan debt stands out as a challenge keeping would-be buyers out of the market. These buyers indicated that student loan debt inhibited their ability to save for a home purchase or down payment. Even in a thriving economy with an abundance of job opportunities , monthly student loan payments coupled with sky-high rents and rising home prices make it exceedingly hard for potential buyers to put aside savings for a down payment. Down payments higher for all buyers. Overall, home buyers paid a median 13 percent down payment, up from 10 percent last year. First-time home buyers paid a median 7 percent, up from 5 percent last year. A majority of home buyers ranked their personal savings as the primary source of their down payment. 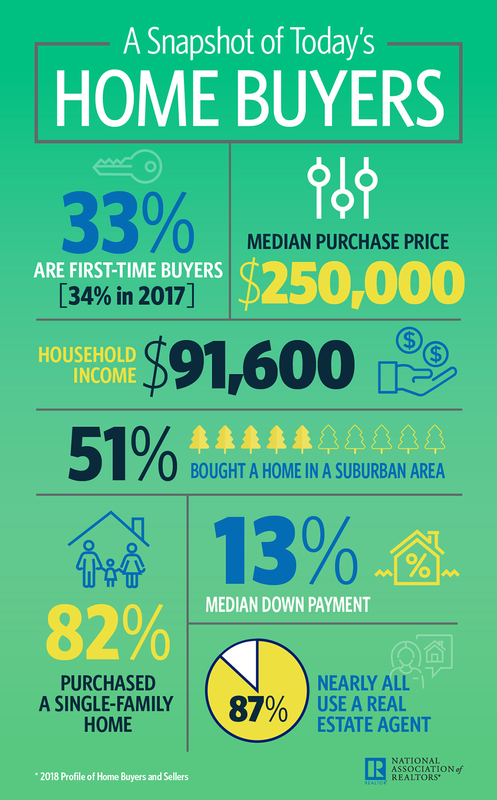 Repeat buyers were most likely to use the proceeds from the sale of their residence, while first-time buyers were most likely to use a gift from a friend or relative. Nearly all buyers choose a single-family home. A majority of home buyers continue to choose a detached, single-family home (82 percent) as opposed to a townhouse or row house (8 percent) or a condo (4 percent). Median age of repeat home buyers skyrockets, stays flat for first-time buyers. For the third straight year, the median age of first-time home buyers was 32 years old. A majority of first-time buyers were married (54 percent). 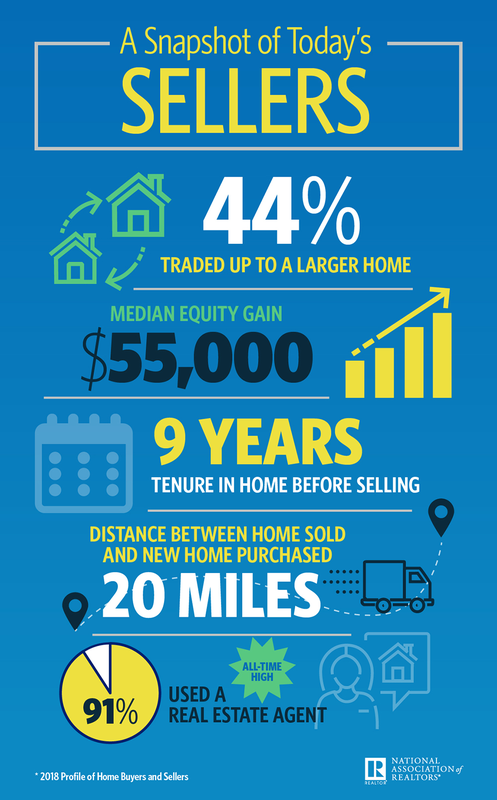 The age of repeat buyers increased to an all-time high of 55 years old (up from 54 last year). Pets influencing home buying decisions. Fifteen percent of all home buyers said that the convenience to vets and/or outdoor spaces for their pet was a critical factor in determining where they wanted to purchase their home. This number rises to 20 percent for unmarried buyers. When buyers purchase their home they are buying it with the needs of their whole family in mind. Any pet owner will tell you that their animals are an important part of their family. Downsizing is not a trend. Only 9 percent of buyers listed downsizing as a factor in their decision to move. In fact, 73 percent of all home buyers purchased a home that was larger or the same size as their previous residence. This lack of downsizing may be attributed to the fact that these buyers may be competing for the same smaller homes as the first-time buyers and there is a scarcity of inventory for these homes. For-Sale-by-Owner (FSBO’s) at a record low. For-Sale-By-Owner sales accounted for just 7 percent of all sales – the lowest number recorded in this survey’s history. This number has steadily declined since a high of 15 percent in 1981, with more and more home sellers relying on the expertise of a real estate agent to guide them through the complicated process and intricacies of the home sale process. For more information about how the activities of today’s buyers and sellers will affect your real estate transaction, contact Realtor Dan Kokesh.